It is almost impossible to resist a good caramel apple. Not only are they stunning to look at, but the combination of slightly salty, buttery caramel with sweet-tart juicy apples is pretty close to perfect. I’ve worked on making a good caramel apple recipe for a long time. It is tempting just to use store bought caramels (good quality, of course!) because they are very convenient and melt down in just a few seconds in the microwave. It is much more satisfying – not to mention tastier – to make your own Caramel Apples from scratch. To make the apples, start by cooking sugar, water and a small amount of corn syrup (golden syrup is a good substitute if you don’t have corn syrup) together in a large saucepan until it turns dark golden in color, then you stir in heavy cream, butter and salt. I usually cook the first portion of this recipe without a candy thermometer, because it is very easy to see the color of the sugar turning a deep gold. Once the cream and butter have been added, the caramel needs to cook until it reaches hard ball stage (260F) so that it will be thick enough to stick to the apples without simply running down the sides of the fruit. You will need a candy thermometer at this point to ensure that you get accurate results. The caramel making process is not difficult, it just requires a little bit of patience. When you’re making caramel apples, you can really use almost any kind of apple that you like. Some people really like tart Granny Smith apples as a contrast to the caramel. Others prefer a sweet apple, any kind that they would normally choose for a snack. I tend to use the same types of apples that make good choices for apple pie, apples that are crisp have a bright flavor, like Braeburn, Fuji and Pink Lady apples. I also like the look of a red apple underneath all that caramel, so I definitely go out of my way to choose particularly good looking apples when I’m ready to make a batch of these! Once the apples are dipped, place them on a silpat or a piece of parchment paper to set up and they will be easy to peel off once the caramel has cooled. This recipe makes enough caramel to cover 6 large apples. You can double it (be sure to use a much larger saucepan!) if you want to make more, though I would recruit an assistant to help with dipping if you’re going to make that many. They will keep well for several days, but should be kept in a cool, dry place if you’re not going to indulge right away. Insert single chopstick vertically into each apple. Place a sheet of parchment paper or a silpad on a large, flat surface, such as a baking sheet or the countertop. Pour caramel into a deep glass or pyrex bowl or large measuring cup. Stir regularly with a spatula for 4-5 minutes, until caramel cools slightly. Dip the apples one by one into the caramel and swirl to coat. Allow excess caramel to drip off. Place on prepared parchment and allow to cool completely. beautiful! i’ve never made them from scratch before. i’ve always used store bought carmels (and actually, i just dip slices in cause it seems easier 🙂 ) but these look so yummy!! i’ll have to give them a try! I am seriously thinking about doing this with quarters or eighths of cored apples. Easier & more convenient to bite into. A more controlled portion. A higher ratio of caramel to fruit. If I did that, how long would you estimate I’d need to let the caramel drip off each unstable piece before I could get it to balance on the soft/hardening caramel? Is there a limit to how long the caramel would remain dip-able if each piece took forever-and-a-half for my fussy approach? Or should I spear each apple piece into, say, a marshmallow that would render it stable? Do you think that would work? What a great and seasonal topic! We have a foster child in our house and she has never done Halloween festivities. 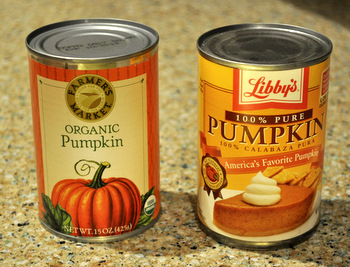 So i’m going to get some pumpkins and we are definitely making caramel apples. beautiful! I’ve always wanted to make them from scratch, since they don’t sell caramel candies in the country where I live. Yum! Rainey – Good questions. 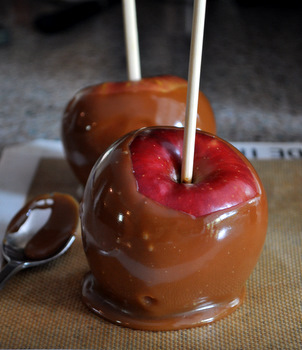 The caramel only needs to drip off the whole apple for maybe 10 to 15seconds or so. It is quite thick, and the excess comes off fairly quickly. With apple slices, I think that the best route would be to dip them and immediately transfer them to a silpat or parchment. The caramel doesn’t harden fast enough that it would completely set while the slice is still in your hand, so it would be better to put the apple down and minimize how much caramel can run off. I would even pop the slices into the fridge ASAP to encourage the caramel to set. With this method, I think that the caramel will stay dippable long enough to do many apple slices, from several apples. Try to use a not-too-juicy apple (and maybe blot the slices before dipping), because the juicer the apple, the more likely that the caramel will try to run off. NIcole, thanks for your response. Yes, absolutely, to drying them as much as possible. 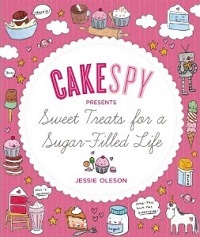 I’m also now thinking about just doing chunks as bonbons and fishing them out of the caramel with a dipping fork. Anyway, your apples look scrumptious and I’m delighted to have your caramel recipe. I was reminiscing over lunch with my husband yesterday about making caramel apples as a kid with melted commercial caramels and an enormous pile of celophane wrappers that came off each one. Much more fun to whip up a batch of liquid caramel and have an enormous stack of things to dip in it. ;> I’m still thinking about those marshmallows and probably pretzels. Will have to see what else occurs. Nothing beats a Fall classic like this. OMG, Pattypro! How beyond perfect! Thanks so much for that link. I am always amazed at the creativity there is in food. And thanks again, Nicole, for creating this thread! These are all great ideas, but I want to know how to properly wrap the caramel apples so the kids can get the apples home without other candy sticking to them, but so the wrap doesn’t stick as well. And that they have as good a caramel apple to eat as what I prepared. Stacey – You should be able to wrap these apples in plastic. I recommend wax paper or a thicker plastic (not something like Saran Wrap) so that it comes off easily when you’re ready to eat them. The caramel is soft, but not sticky when it sets.